Twinkle, Twinkle, Little Spy was first published in hardback by Jonathan Cape in 1976. I bought this rather nice copy in the Kirkdale Bookshop, over the road from Sydenham Station; should you ever find yourself in those insalubrious parts, it's well worth popping in (to the bookshop, not to Sydenham Station – unless of course you're intending on getting the hell out of Sydenham, in which case, you would have both my sympathy and my understanding). New books are displayed in the front half of the shop, and then towards the back and down in the basement is a sizable selection of second hand fare, with a couple of bookcases-worth of modern firsts and an impressive stock of books on cricket, gardening, history, cinema, theatre, and so forth. The prices are very reasonable too. 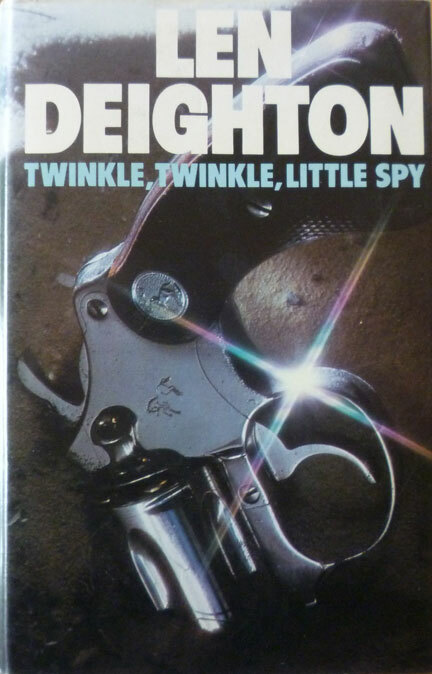 Twinkle, Twinkle, Little Spy may or may not be an entry in Len Deighton's first-person series starring the unnamed British spy subsequently monikered Harry Palmer in the films adapted from the novels. 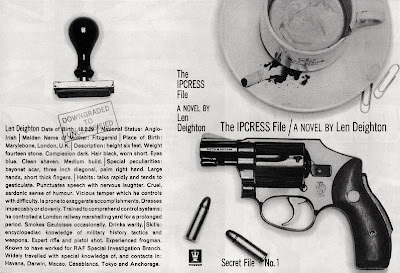 Even the main Len Deighton website can't make up its mind whether it is or not, which only goes to highlight the problem of not naming your lead character. 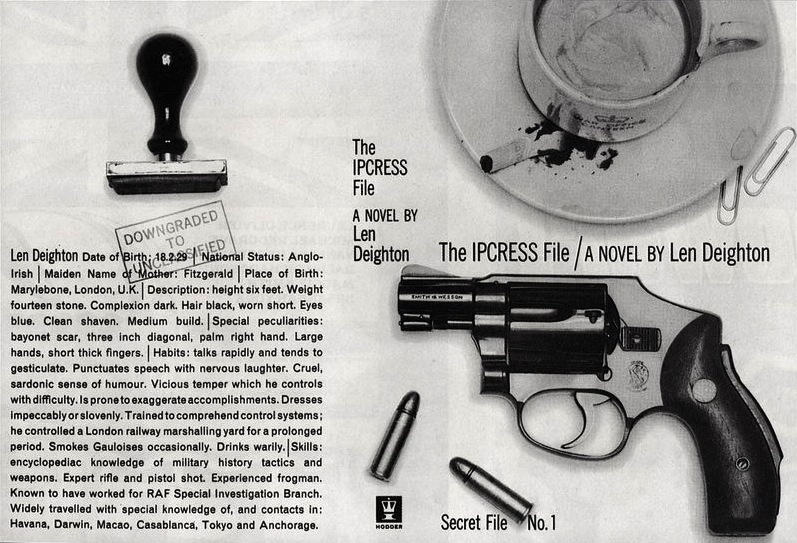 Apparently if you've read the previous books in the series – from 1962's The Ipcress File to 1967's An Expensive Place to Die, although there's also some doubt over whether it's the same unnamed spy in that last one – you'll be able to draw your own conclusions as to whether Twinkle, Twinkle, Little Spy is part of that run. But since I haven't, it's not a poser I need to trouble myself with particularly. 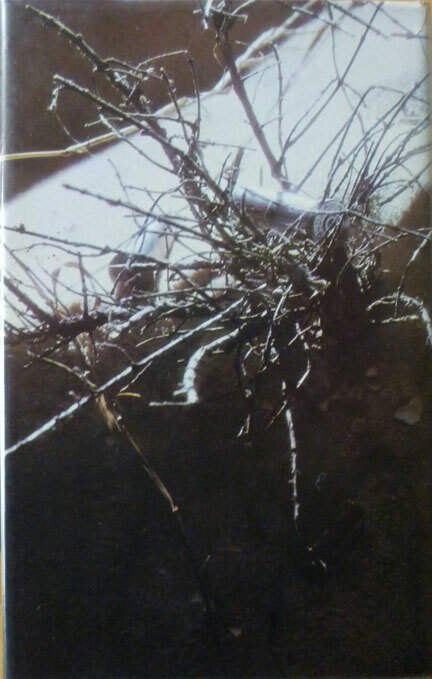 Raymond Hawkey designed the jackets for many of Deighton's novels, working with different photographers to achieve his vision. Props such as a gun or a skull would be placed in intriguing and suggestive arrangements, and then type incorporated with the finished photo. The photographer on Twinkle, Twinkle was Adrian Flowers, who was a key figure at influential illustration agency Artist Partners; aside from photographing book covers he also took pictures for this article on "A Day in the Life of Len Deighton", which was penned by Deighton himself. Thanks for linking to my site - after further consideration, I believe that the lead character in this book is not the same character as in the earlier novels! Although, I'm only 95% sure! Heh heh, thanks Rob! 95% is good enough for me. Let's state for the record it's not the same man as in the earlier Deighton books.